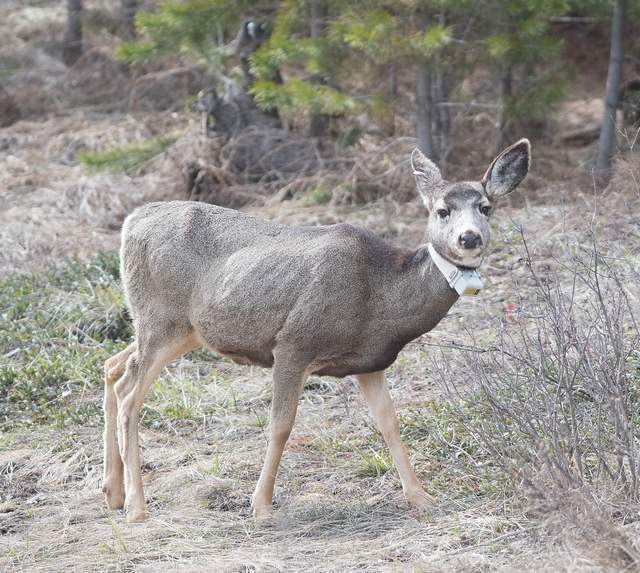 The ongoing mule deer study is turning up some interesting data . . . Preliminary data from a 2-1/2-year long mule deer study is showing some interesting facets in the animals’ behavior and movement across the landscape in Northwest Montana. Researchers from the University of Montana in cooperation with Montana Fish Wildlife and Parks, radio collared 44 mule deer on the Rocky Mountain Front near Augusta, 26 in the Fisher River drainage and 31 in the Whitefish range. Currently, of those deer, 26 are still “on air” along the front, 21 near the Fisher and 19 in the Whitefish Range. State agencies are trying to figure out what’s going on with mule deer populations over recent decades . . .
Wildlife management agencies, hunters and wildlife organizations have done a lot of research, habitat work and plain old head scratching in recent years over what is causing a decline in the number of mule deer across parts of the West. A recent report by Western wildlife agencies found mule deer declining in four states, including Wyoming, and one Canadian province. Montana’s population was reported as stable, although certain regional populations have seen some dramatic declines. “Certainly numbers are still down,” said Quentin Kujala, Fish, Wildlife and Parks wildlife management section chief, but whether that constitutes a downward trend or simply a temporary pause he could not say.